The temperatures are slowly rising as the summer sun wins over the famous British rain. What foods should we choose in the warm weather to nourish our body without feeling heavy? 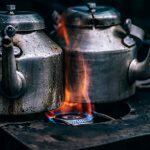 Countries with traditionally hot summer – like India – have many great dishes to offer. They will leave you feeling well-fed and refreshed at the same time. 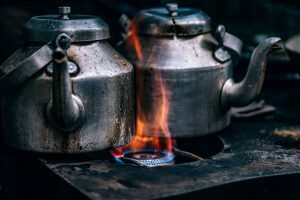 The secret is, there are certain ingredients in these foods that will cool your body when the temperatures rise and will keep your energy levels stable. If you want to know which are those ingredients, just keep reading! 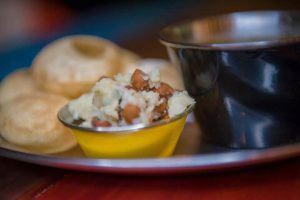 Pani Puri is one of the most popular street snacks in many regions of the Indian subcontinent. It has a different name and spelling according to the region but no matter how it’s called, everyone will recognize the delicious fried crispy shells with aromatic fillings. The puffed hollow pastry rounds are served with flavoured water, tamarind chutney, onion, potatoes, chickpeas and sometimes yoghurt. They could come already filled with the well-seasoned mixture or separately in order to preserve the crispiness of the hallow pastry shells. Then you would be the one to put the mouthwatering mixture of vegetables, spices and chutney or minty water inside. In both cases, this dish is very tasty, light and refreshing in the hot weather! Another beloved Indian street food dish, samosas are golden-brown fried triangles made with wheat flour and a tasteful filling. The most popular choice is vegetarian savoury filling such as mashed potatoes, green peas, chickpeas, onions and spices. Samosas are often served with mint or tamarind chutney. The ones in Delhi and Punjab are bigger compared to other Indian and foreign variants. This is why our recommended portion is 2 pieces per person, although you would normally feel the temptation to eat more of them. This dish first appeared in Kolkata. It was originally a grilled chicken or lamb kebab wrapped in a paratha bread. Due to its great taste, however, many variations were created soon including paneer, egg, potato or a vegetable mix. 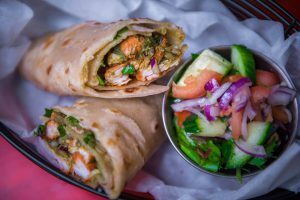 Nowadays most of the wraps consisting of some filling and an Indian flatbread (roti or paratha) are called kathi rolls. It’s easy to understand why they became one of the most popular street food dishes: tasty, filling (but not too heavy!) and convenient to eat on the go, kathi rolls are a great option for a relatively light and quick meal. One more delicious chaat (Indian street food starter), Bel Puri is a perfect mixture of salty, sweet and spicy flavours, as well as different textures like crispy and crunchy from the puffed rice and fried sev. 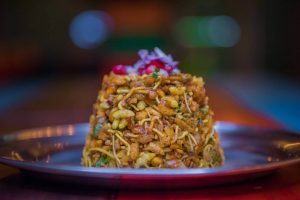 At Indico we make it with puffed rice and gram flour, peanuts and sev tossed with onions, pomegranate and tamarind chutney. Sev is a fried noodles-like snack made from gram (chickpeas) flour. In some recipes tomatoes, chilis or even potatoes cut in small pieces could be added to the base. The chutneys add a whole new dimension to this lovely dish. The most popular options to pair it with are tamarind or mint chutney. Can you imagine a summer without ice cream? The delicious Indian version, however, is a little bit different from its Western sibling. It’s still the frozen diary-based sweet indulgence we all know and love but it’s creamier and denser. 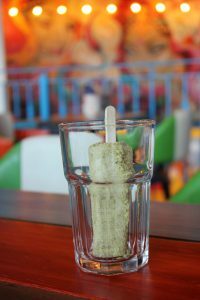 The reason is that kulfi is not whipped and when frozen is much more solid and melts slower. The most traditional flavours are pistachio, rose, mango, cardamom, and saffron. Indian dishes will often include ingredients like mint, tamarind, yoghurt and onions which are proven to have a cooling effect and help digestion in general. But remember: it’s not only the type of food, it’s also the quantity! If you don’t overeat in the hot weather, you are less likely to feel heavy and lethargic after a meal. 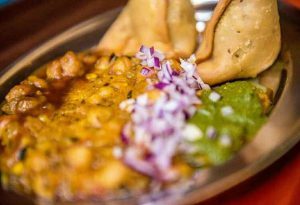 Indian street food offers many delicious and light options great for every time of the day.